Fee: $1000 (includes lunch on Saturday & Sunday; dinner on Friday, Saturday & Sunday). Materials not provided; a supply list will be available. Lodging Package: A special three-night lodging package (Friday, Saturday, Sunday) is available at the Washington House Inn in historic Cedarburg, WI (www.washingtonhouseinn.com). Rooms range from $130.50-$166.50 per night; this includes a continental breakfast and an afternoon social hour with wine and cheese. Reserve lodging directly with Washington House Inn at 1-888-554-9545; specify Lynden Sculpture Garden Workshop package. Rooms must be booked no later than July 2, 2012. Registration: Space is very limited; advance registration is required. To download a registration form, click here. If you have any questions, please contact Polly Morris at pmorris@lyndensculpturegarden.org or 414-446-8794. Eric Aho’s paintings are a direct response to nature, whether they are images of the New England landscape that capture dramatic effects of weather and sunlight, or his more recent energetic, freely brushed abstract compositions. He invites professional and vocational artists to join him for a weekend outdoor intensive at the Lynden Sculpture Garden where, working among the sculptures, trees and plantings, participants will respond to the light and landscape of high summer. Step out of the studio and advance your skills in a collegial atmosphere under the supervision of a master artist known for his plein air painting. Eric Aho (American, b. 1966) studied at the Central School of Art and Design in London, England and received a BFA from the Massachusetts College of Art in Boston. In 1989 he participated in the first exchange of scholars in over thirty years between the U.S. and Cuba. He completed his graduate work at the Lahti Art Institute in Finland supported by a Fulbright Fellowship in 1991-92 and an American-Scandinavian Foundation grant in 1993. Additional fellowships and grants from the Vermont Council on the Arts and the National Endowment for the Arts, the Pollock-Krasner Foundation, the Vermont Community Foundation and the Finlandia Foundation and the American Scandinavian Foundation in New York have facilitated many projects over the past twenty years. Aho has taught painting at the Putney School in Putney, Vermont, the Theater Academy of Finland in Helsinki, Finland and the University of Lapland in Rovaniemi, Finland. He has been a visiting artist and critic at the Burren College of Art in County Clare, Ireland; the Ballinglen Arts Foundation in County Mayo Ireland; the Weir Farm National Historic Trust in Connecticut; Colgate University in Hamilton, New York; the National College of Art in Oslo, Norway; the University of Art and Design in Helsinki, Finland; the St. Paul’s School, Concord, New Hampshire and the Harvard Graduate School of Design. Aho’s exhibitions include the Portland Museum of Art in Portland, Maine; the Aldrich Museum of Contemporary Art in Ridgefield, Connecticut; the Hood Museum of Art at Dartmouth College; the Fitchburg Art Museum in Fitchburg, Massachusetts; the Ogunquit Museum of American Art, Maine; the McMullen Museum at Boston College; the Nagoya/Boston Museum of Fine Arts, Nagoya, Japan; the National Academy of Design and the American Academy of Arts and Letters in New York City; the Oulu City Art Museum in Oulu, Finland; and the Fleming Museum at the University of Vermont. Upcoming exhibitions include a ten-year survey of Aho’s paintings at the Currier Museum of Art in Manchester, New Hampshire (June 2-September 9, 2012) and an exhibition at Tory Folliard Gallery in Milwaukee in October 2012. Aho’s work has been presented in numerous gallery exhibitions and is represented in private and public collections throughout the country and abroad including the permanent collections of the Fleming Museum, the Oulu City Art Museum, the Ballinglen Arts Foundation, the Fine Arts Museum of San Francisco, the Ogunquit Museum of American Art, the Provincetown Art Association and Museum, the Metropolitan Museum of Art, the New York Public Library, and the Museum of Fine Arts, Boston. 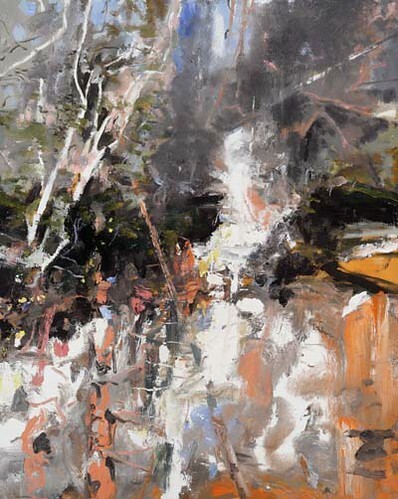 Eric Aho is represented by Tory Folliard Gallery in Milwaukee and DC Moore Gallery in New York. He lives and works in Saxtons River, Vermont. More information: http://ericaho.com/.